Submitted by Mike Penn on 3 December 2018. Clcik the "Media" tab to see the YouTube video! 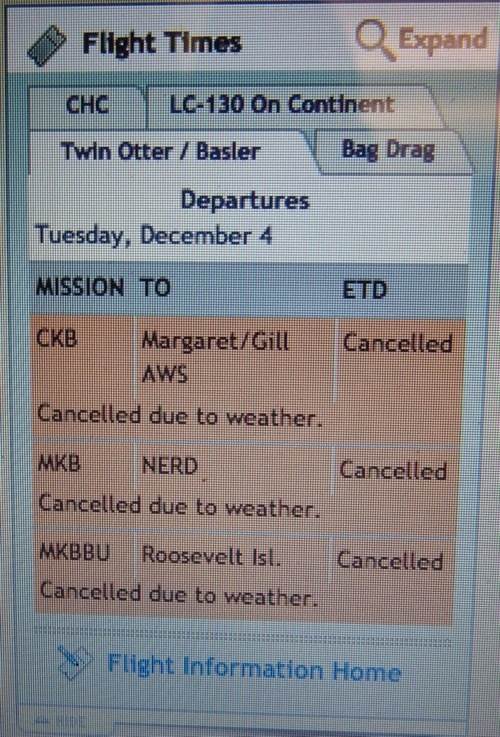 The flight board showing the cancellation of the flight to Gill AWS. We were on the list to fly out (on an airplane called a "Twin Otter") to two Automatic Weather Station (AWS) sites that are located about 500 miles (800 km) to the "Grid West" of here. But our flight was canceled due to weather. That means I have time to write a journal! We are also working on checking the wiring, memory, data loggers and transmitting capacity of the AWS equipment that we will be working with in the coming weeks. 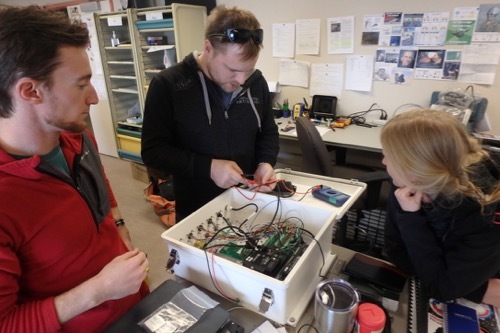 The 2018 Automatic Weather Station team is checking the instruments before they are deployed in Antarctica. Weather today was very...Antarctica-like! McMurdo Station, Antarctica. The weather here in Antarctica is categorized by the numbers 1, 2 and 3. The definitions are listed below. Today is Condition 1 and 2 here in places. That means that the weather is...NASTY. 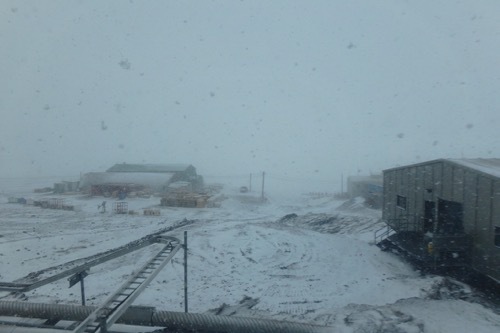 It is snowing and there is a lot of blowing snow and the wind is gusting to 35 knots (according to the McMurdo weather station). Take a look at the YouTube video to see the difference between a nice day and a "Condition 2" day. Take a look at the definitions. It is considered a "good" day as long as winds less than 48 knots, visibility greater than or equal to ¼ mile, and wind chill temperatures are warmer than -75°F. Sounds like a nice weather day...right? Severe weather is in progress. All personnel must remain in buildings or the nearest shelter. Winds greater than 55 knots sustained for one minute, or visibility less than 100 feet sustained for one minute, or wind chill greater than -100°F sustained for one minute. Restricted pedestrian traffic only between buildings is allowed. Vehicular travel is only allowed in radio equipped, enclosed vehicles, and check out with the Firehouse. Winds 48 to 55 knots sustained for one minute, or visibility less than ¼ mile, but greater than or equal to 100 feet sustained for one minute, or wind chill -75°F to -100°F sustained for one minute. Unrestricted travel and activity are allowed. Winds less than 48 knots, and visibility greater than or equal to ¼ mile, and wind chill temperature warmer than -75°F. 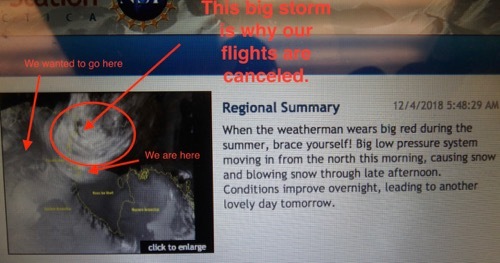 A satellite image showing why our flights were canceled today. Hi Mr. Penn. We were just watching your video about the weather. The kids want to know if you are scared and has the weather been in the 3 category since you have been there? Hi Mrs. McGuire! - (Mrs. McGuire teaches just down the hall from me back in Pennsylvania!) Nope, I'm not scared. We are well trained and well equipped. Everyone knows what they are doing to avoid potential problems, Having said that, everyone here has a very healthy respect for his harsh and rapidly changing environment. It is the lack of knowledge and the lack of training that is dangerous here (or in life in general...really!). Keep the questions coming! Thank you for reading the journals and taking the time to ask a question! Elijah, I am ROCKIN' this beard! Pretty soon, probably by New Year's Eve I'll look just like "Father Time!" Thanks for checking in! Gary, LOL there are a LOT of NERDS here! Sadly, that NERD refers to a place, not a person. NERD is the United States Air Operations "International Designator" for a place called "Hercules Dome." It is a large ice dome,very near the South Pole, between the Horlick and Thiel Mountains in the southern part of Westarctica. (about 86°S 105°W). Thank you! I wondered if anyone would catch that...I'm glad you asked because it spurred me to look it up!